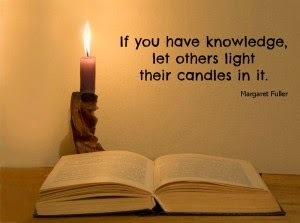 Learning at school must light the 'lamp of knowledge' in each one of us. Knowledge is a familiarity, awareness or understanding of someone or something, such as facts, information, descriptions, or skills, which is acquired through experience or education by perceiving, discovering, or learning. 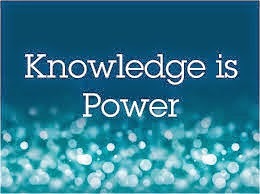 Knowledge can refer to a theoretical or practical understanding of a subject. It can be implicit (as with practical skill or expertise) or explicit (as with the theoretical understanding of a subject); it can be more or less formal or systematic. In philosophy, the study of knowledge is called epistemology; the philosopher Plato famously defined knowledge as "justified true belief", though "well-justified true belief" is more complete. Our Education process is more towards imparting information and encourages rote learning. Rote learning is a memorisation technique based on repetition. The idea is that one will be able to quickly recall the meaning of the material the more one repeats it. Alternatives to rote learning include meaningful learning, associative learning, and active learning. This is where we must value the power of knowledge and work towards the development of the knowledge base and empowering our young people with thinking ability and acquisition of skills for life. 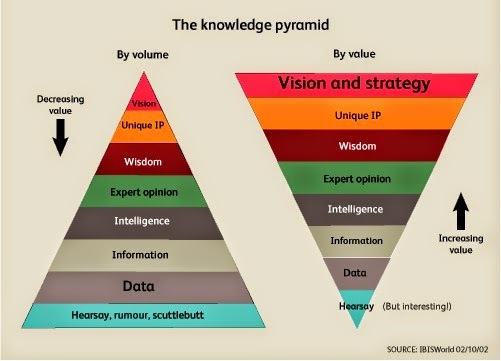 Knowledge must help an individual grow his vision and thinking, look at the pyramid on the left, here information is way down. Data (information) today is available in large volume and the ability to comprehend big data to help us grow our intellect is what we need to help develop. While information may be easy to find and assimilate, the learning process at school must help us to be analytical and empower us to find the leadership within. Barbara Schieffelin Powell is an international educational consultant in curriculum development, teacher education and evaluation. She has helped deliver The Fabindia School Leadership Development Project and has been instrumental in helping deliver the mission and vision of the School. 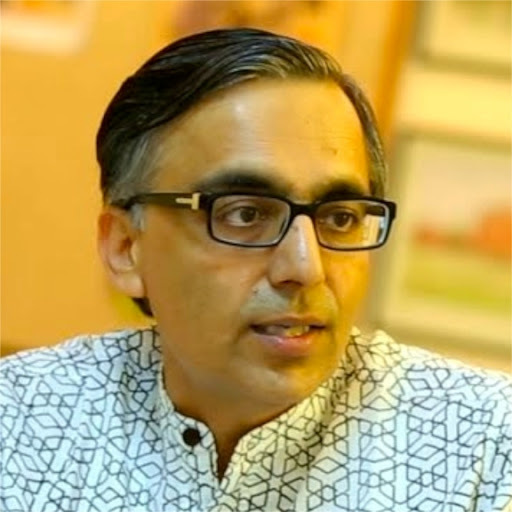 The Fabindia School has experienced a leadership change, encountered the resistance to efforts to improve teaching performance, and began the process of moving away from “by-hearting” to more active learning. Early efforts at improving teacher performance, such as goal setting and classroom observation, were first vigorously resisted. The Principal began with a careful program of classroom observation and discussion with teachers. Teachers were exposed to examples of more active learning by visiting other schools. Although the teachers helped develop this vision, they have had not yet adopted attitudes and practices that embody the vision. The monthly teacher training workshops are structured to help teachers identify their strengths and become self-directed and collaborative learners. Creating a different school culture which engages teachers in a vibrant and ambitious learning community is an essential and painstaking process which only evolves over time. “We still have a long way to travel, but we’re on the road” states Barbara S. Powell. After two years it should be clear (if there was any doubt) that building a professional culture in a school consists not of a quick fix (like a pill) but of a complex effort to change the culture within which teachers work. It is often slow work and hard work, but we have made progress and look forward to the next stage. Generating widespread organisational change requires a comprehensive approach. Collaborative learning is a situation in which two or more people learn or attempt to learn something together. Knowledge can only be built by collaborative learning and not by rote. Information delivery is a process while knowledge assimilation is true learning. In the Bhagavad Gita, Krishna used the term ''Lamp of Knowledge", and true knowledge is which destroys the darkness of ignorance. We may start the journey of learning with information, but must work to light the lamp of knowledge. Tell us what you think students are learning at school – not in terms of academic content, but in terms of “life lessons” and “soft skills.” Are you learning, for example, how to follow directions? How to interpret text? How to cooperate and collaborate? How to be open to new ideas? How to think critically? What skills do you think you will most need to succeed in career and life? Share with us your thoughts and add comments to this article. 2. The Free Dictionary online.